More then 25 years of excellence! Multilingual developmental evaluations, early intervention ABA, daycare, and inclusion programs for children ages newborn to 3 ,in home community and our center. Contracted with NYC Early Intervention Program. Speech, language occupational and physical therapies ,special instruction ,ABA, assistive technology, sevice coordination and more. Support groups, educational workshops. social work, and counceling services for families. No out of pocket costs to parents. Challenge provides an intensive behaviorally based program for children on the Autism spectrum. Twenty-five years of excellence! Multilingual developmental evaluations, early intervention, ABA, day care, and inclusion programs for children ages newborn-3 in home, community, and our center. 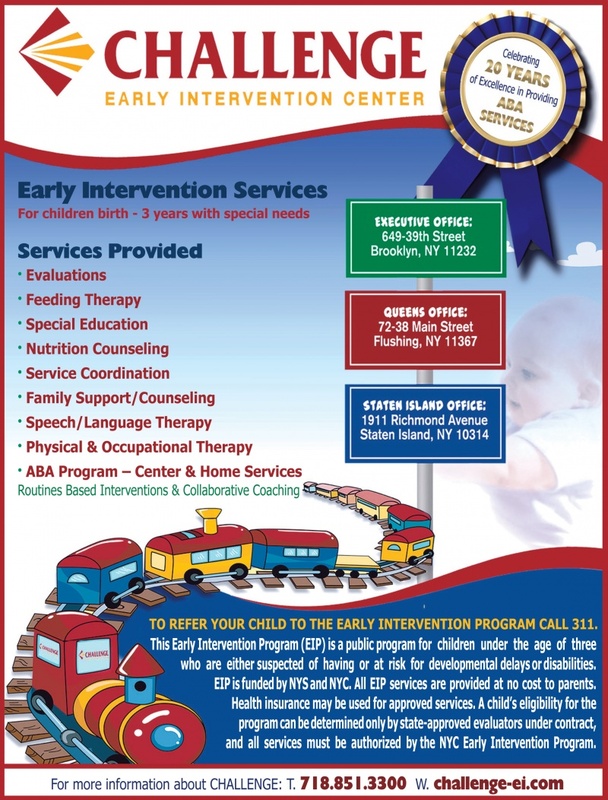 Contracted with NYC Early Intervention Program. Speech-language, occupational, and physical therapies; special instruction; ABA; assistive technology; service coordination; and more. Support groups, educational workshops, social work, and counseling services for families. No out-of-pocket cost to parents. Challenge provides an intensive, behaviorally based program for children on the autism spectrum.